With flurries in the forecast, it's time to take the prospect of winter driving seriously. 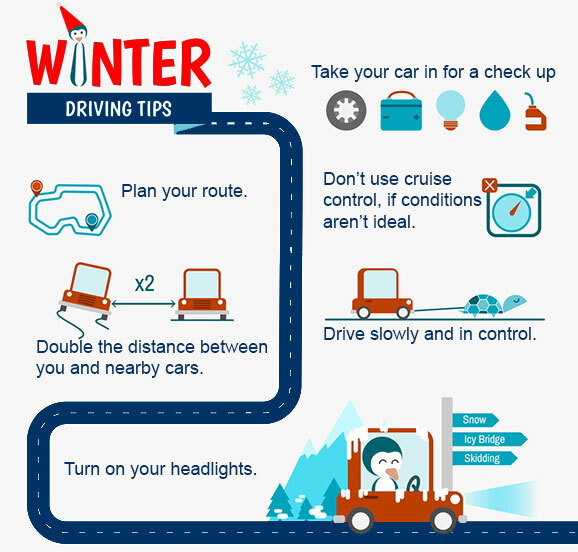 Winter can be one of the most difficult and unpredictable driving seasons, but if you stay alert, slow down, and stay in control, you'll be sure to get where you need to go, safely. Install four winter tires and do not mix-and-match with your summer or all-seasons. A good rule-of-thumb is to put your snow tires on when the temperature is consistently 7° Celsius or colder. Did you know that some insurance companies offer a discount if you install four winter tires each winter, and if you live in Ontario all do? Compare car insurance quotes at Kanetix.ca to see if you could lower your car insurance premiums with a winter tire discount. Be prepared for an emergency. Inventory your winter emergency car kit to make sure you have everything you need in case your car is stuck in the snow or you're stranded at the side of the road. Wear clothing, or have clothing in the car available, that is appropriate for the weather outside, including footwear. While driving, your clothing should not hinder your movement and should be comfortable. Plan your route to avoid confusion and check the weather reports before you leave. Let others know your travelling plans including when you're leaving and when you'll arrive. Be sure you have plenty of windshield washer fluid. It's also a good idea to keep some extra fluid in the car in case you run out. Buckle up. Seatbelts save lives and it's an easy way to avoid getting a ticket. 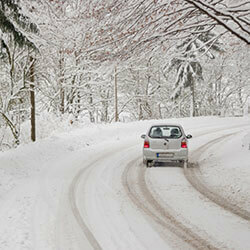 Drive according to the conditions and give yourself extra time for travel. Fill 'er up! Keep the gas tank at least half full to ensure you've got the fuel to get to where you need to go, no matter how long it takes you. Be sure other drivers can see you coming. Use your lights when visibility is reduced as well as when driving at night. Keep a safe distance between yourself and the vehicle in front of you because it takes longer to stop in the winter. What makes a safe distance? Under normal driving conditions, safe spacing is often determined with the two-second rule. In winter, and especially in bad weather, double the two-second rule. This means, at least a 4-second interval from the time the car in front of you passes a fixed object until you reach the same object. When conditions are wintery, don't use cruise control. Winter conditions require you to be in full control of the vehicle at all times. Shaded areas, like bridges and overpasses, have a tendency to freeze sooner and stay frozen longer. Keep this in mind when approaching them and also watch out for black ice as it can cause your vehicle to suddenly lose traction. If you start to skid, look to where you want the vehicle to go and steer in that direction but be careful not to oversteer. With flurries in the forecast, it's official, the season is changing. See if it might be time to change insurance providers too. At Kanetix.ca you can shop the market to find the best car insurance rate out there.